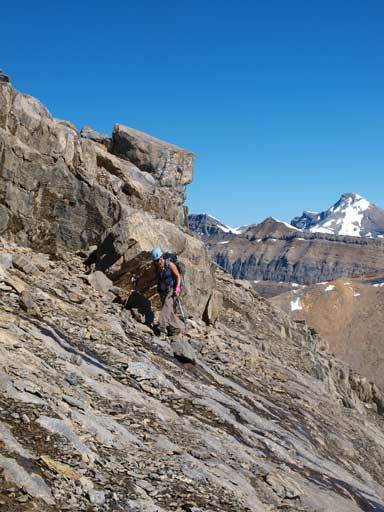 After spending an awesome day in Little Yoho Valley summitting Isolated Peak and Whaleback Mountain, we were looking for something more challenging and rewarding on the following days. Andrea and her group went for Kiwetinok, Pollinger and McArthur, while Mike and I would do the same three plus Mt. Kerr. We grouped together for the first three. These groups of peaks turned out to be so spectacular and this is probably my favourite day in the summer of 2012. 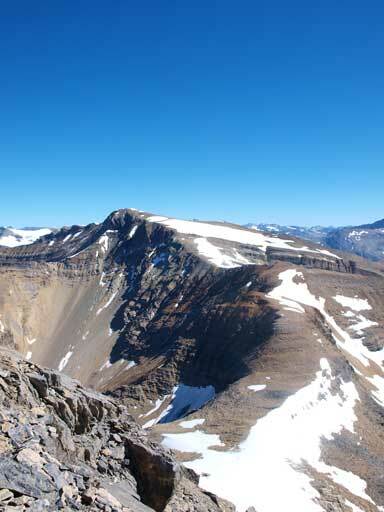 Kiwetinok Peak is one of the trickiest/toughest in Alan Kane’s Scrambles in the Canadian Rockies. Though not as technical/exposed as the infamous Mt. Northover and Mt. 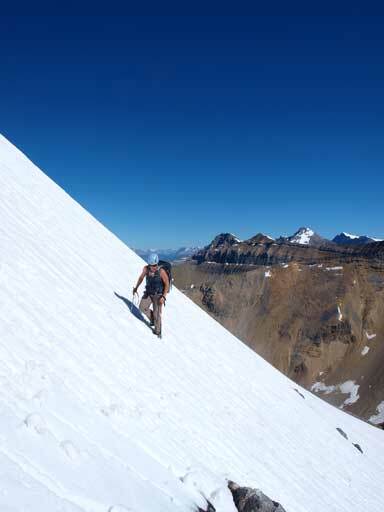 Smuts, it involves ascending steep snow/ice. Depends on how confident you’re on snow, this might be more difficult than you’d expect. 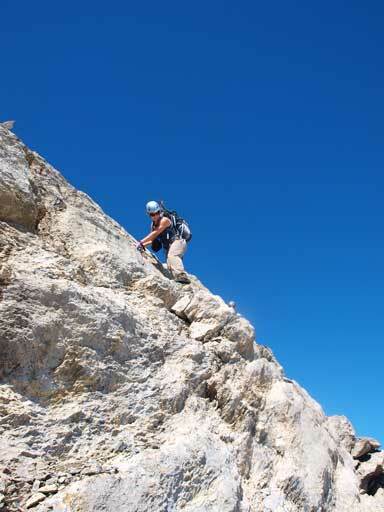 In other words, it involves some degree of “mountaineering” than just scrambling. We were all tired from the previous day’s scrambling and didn’t manage to wake up until 7 am. 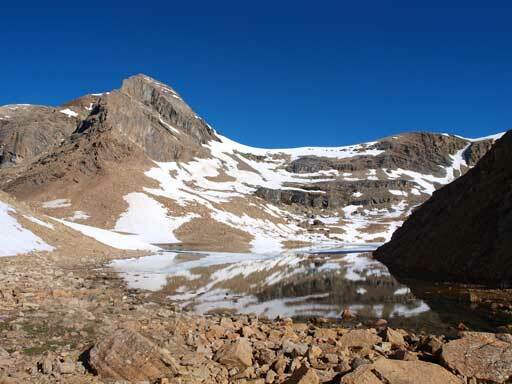 Our first objective was Kiwetinok Peak which was the only one involving climbing on snow. Andrea’s group started the day by doing a river fording. 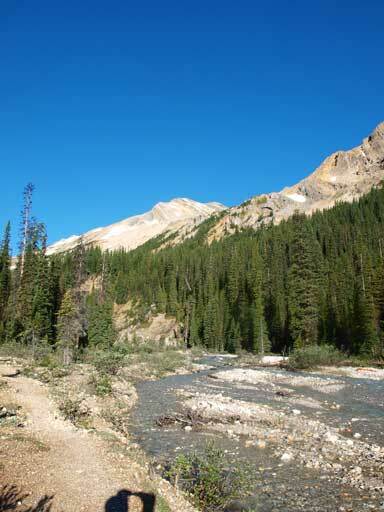 I hate liquid water, so I hiked back to Stanley Mitchell Hut and used the bridge to cross Little Yoho River. This way I added 0.7 km distance. 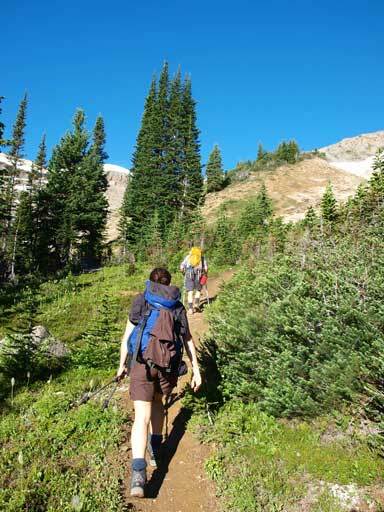 We regrouped and started the trudge to Kiwetinok Pass on a well defined trail. Our pace was slow.. Apart from several creek crossings, there’s no difficulty on this trail. On normal pace you can get to the pass in 1 hour. At the pass, the clear water in Kiwetinok Lake provided good photographing opportunity. 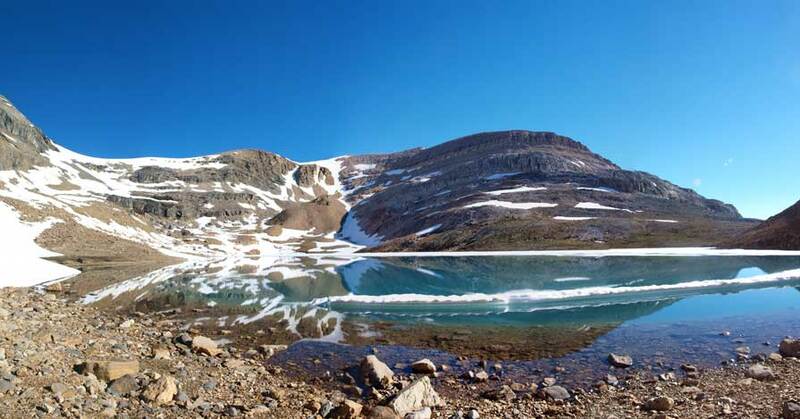 Near the outflow of Kiwetinok Lake. Morning view of Kiwetinok Lake, with Kiwetinok Peak behind. I had the peak in my mind so I didn’t take any break at the lake, but started the ascent towards the Kiwetinok/Pollinger col immediately. By using the snow, I could almost completely avoid the tedious rubble, which was a bonus. 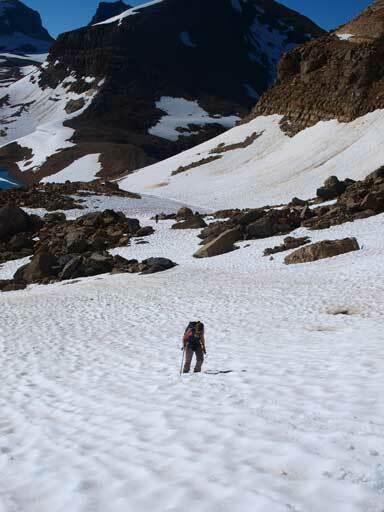 I would suggest you taking out your ice axe if you’re not confident on snow. 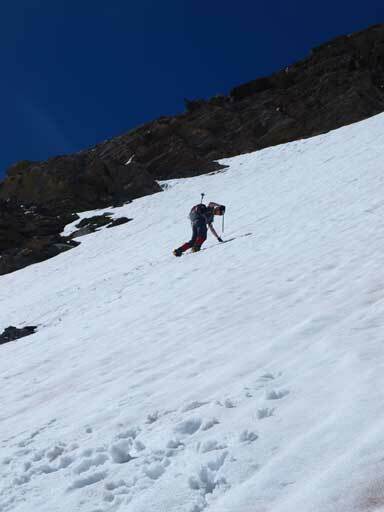 The snow was in good condition and I could kick firm steps, so I didn’t bother using ice axe, and I felt my poles can give more balance. 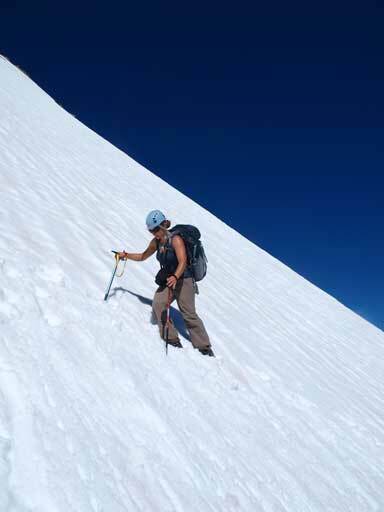 Snow got harder higher up, we trended more towards climber’s right according to Kane’s suggestion. 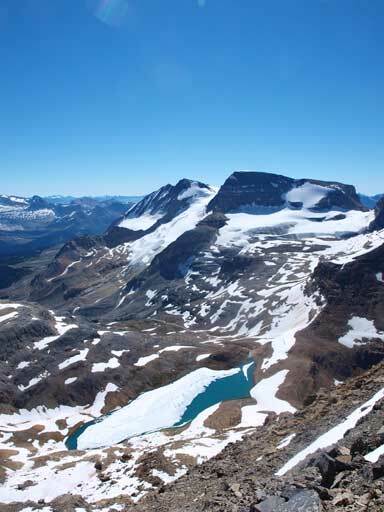 From the col, I got the first head-on view of Freshfield Icefields. It was still snow bound here, and this is the typical snow walk. The slope on Kiwetinok didn’t look as bad as I thought. 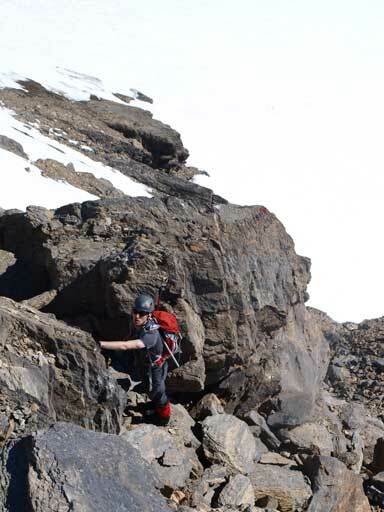 I took out my ice axe and helmet, and soon started the step-kicking. Andrea and Mike followed me behind, but the other 3 decided to stay below. The climb started easily, but got steeper soon as we gaining elevation. For us, the snow was deep enough and I could kick firm steps into the surface. 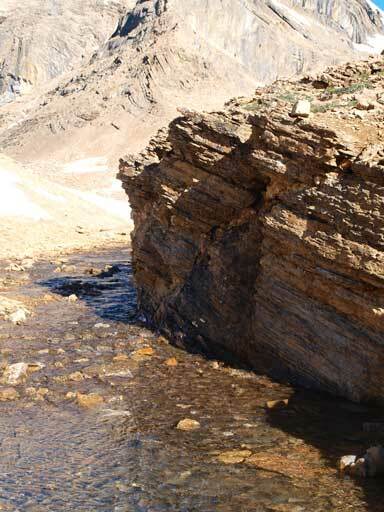 To gain the rock ledge above, I had to traverse left with some exposed run-off. An uncontrolled side would dump us to the rocks and cliffs below… I had to double check every step before moving to the next. We took our time here and three of us got to the rock safely and I felt this section was the crux for the entire trip. 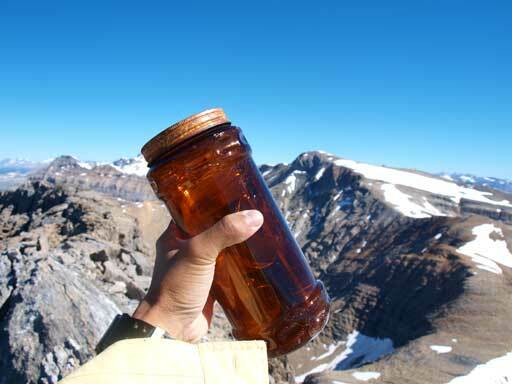 From here to the summit, it was a matter of route-finding. 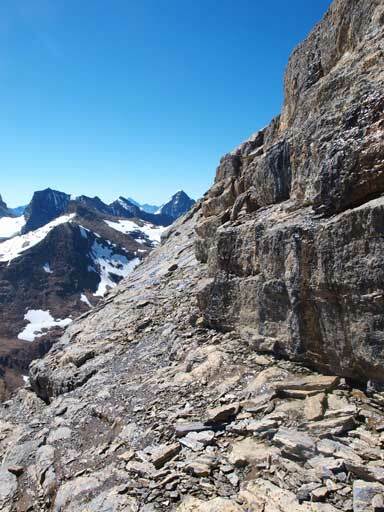 Kane only mentions traversing climber’s left upon reaching a rotten band of shale. That’s obviously vague. I cannot tell the exact line we took. 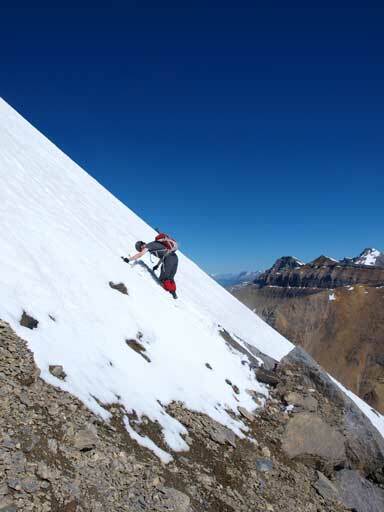 We firstly ascended straight up beside the snow, on steep ledges and slabs. Upon reaching a band that looked like the one Kane talked about, we traversed left. This band was loose and very exposed. At some point we had to break through the rock band immediately above us as the ledge was starting to lead to nowhere. We took slightly different lines from here up, but we all got to the summit without incidence. The highlight of the view was towards the distant Purcells and Selkirks, including the Bugaboos, Sir Donald and Sir Sanford. Andrea just traversed around a corner. We had to traverse this exposed slippery loose ledge. Mount Laussedat is the prominent peak right of center. Mount McArthur doesn’t look that impressive from this angle. Mount Balfour on left. Hector pokes behind. Daly and Niles on right. Due to the concern about snow condition, we didn’t linger any longer, but started heading down soon. 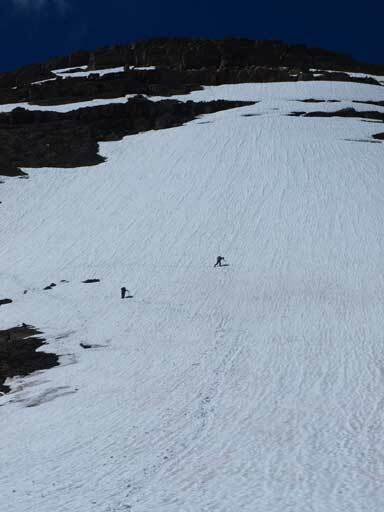 We had fresh memory of our ascending line, so we managed to retrace our steps down almost exactly, to the snow slope. 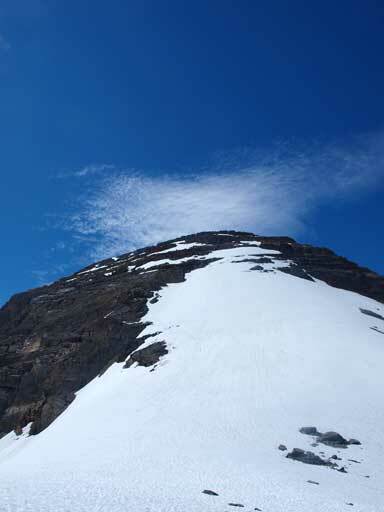 Again, the terrain was very loose, and I carelessly dislodged a soccer ball sized rock, and watched it tumbled down the snow slope, then the cliff bands below… This is an example of doing an uncontrolled slide… Oh well… The snow got softer but was still okay to descend. I just had to kick further in to be sure. 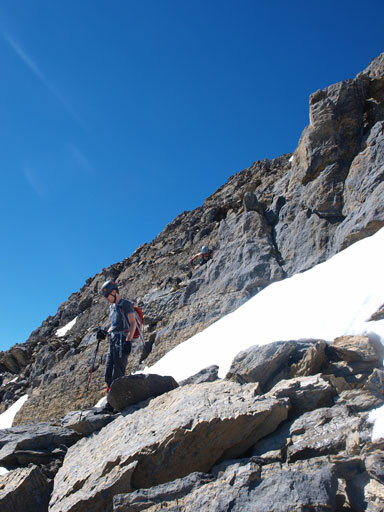 The next 10 min was very awkward, as we were facing inwards while doing diagonal traverse. Andrea and Mike smartly put their crampons on which made things easier. While I got to a safer position, I set a glissade which quickly brought me down to the col. Andrea and Mike followed me behind. Andrea (left) followed my steps, while Mike chose a horizontal line. Now the toughest part of the trip is over!! I could take a long breathe as I knew our trip to Little Yoho would be a success! We bumped into 3 mountaineers who traversed from Isolated Peak via Glacier des Poilus and they turned out to be Wietse, Kevin Papke and Steve. After discussing about the condition on Kiwetinok, they decided to give it a miss due to the snow condition. 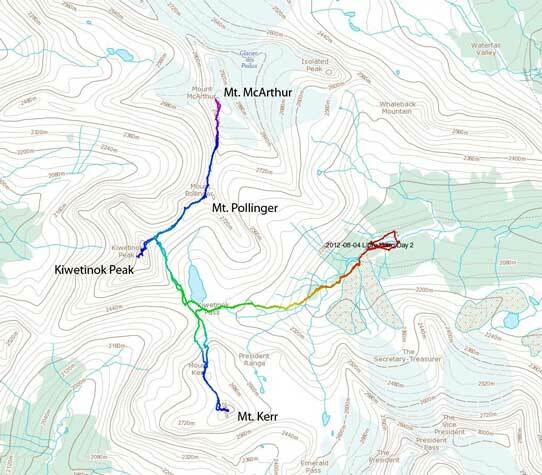 Kevin talked about the plan on Saturday to Fisher Peak which caught my interest. 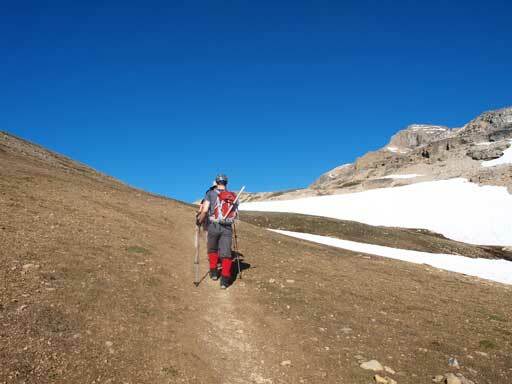 After saying goodbye to them, we started the trudge towards Mount Pollinger.